You can rate any digital resources in your school’s MackinVIA collection. Choose from one star (low) to five stars (high). To rate a resource, log into your Backpack and select the resource. Click on the title, cover image, or More Info to access the Full Record page. 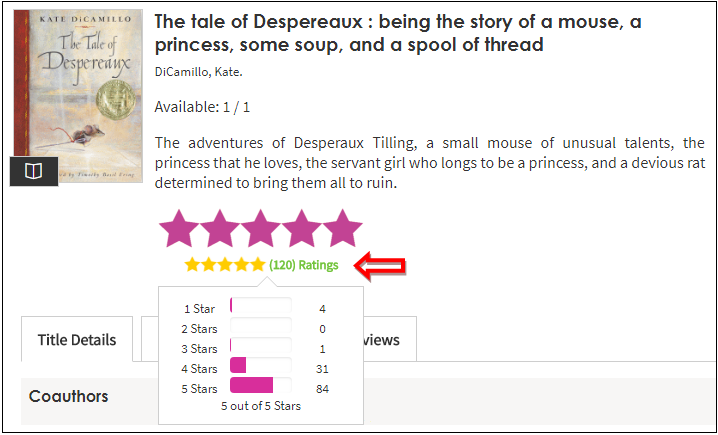 Select the number of stars to rate it. To be the first to rate a resource, click Rate this! and select the number of stars. How do I see other ratings? To see how others have rated a resource, go to the Full Record page of the resource and click on Ratings. The total number of ratings is listed along with a breakdown of the stars.